Oh Congratulations...you have the greenest thumb of anyone I know...just amazingly beautiful. Kudos. Thanks so much ! Truth is, you change stuff around enough, for long enough, eventually you just get lucky. Now I really would love to walk down your lovely path and admire the borders. Looks wonderful. You should be so proud of your garden, it is superb. This looks so friendly and inviting, pitty I live so far away. So you live in the hills too? At least you have a sloping site. I see the datura, what is growing over the arch? I'd love nothing better than to have your company ladies ! Marguerite, I live on a small lake, so all of my property, unfortunately slopes down toward the water.The left side of the arch has a moonvine growing on it , and here are two cultivars of clematis on the right side. Thanks Sandra and Skippy. Thank goodness for cameras and pictures, this way, when I 'm too old to garden anymore and the yard has turned back to dirt, I can look at my pictures and remember it wasn't always that way.! That's assuming I'm lucky enough to get old...lol. this is a phenomenal path. I so need someone like you around to help me with my gardens at the house I just bought. We bought from an older couple that just could not keep up with it all anymore. Thanks Shoobyshar and Eckie ! Shoobyshar, just take your time, work on small sections at a time . Dive in when you feel like it, instead of when you feel you need to, and hopefully you'll enjoy every minute of your time in the garden. If you love what you are doing, then you'll will love the end result. Hope you have a blast... can't wait to see your progress next spring. I'll have to go a check out your posts. Thanks Helen ! These beds change every year,depending on what flowers catch my fancy each year. It was really full and color that year. Thanks a million Avis. Still haven't decided what to do with this bed yet this year....lol. I'd better get started figuring it out ! Thanks Jan, it's hard to believe I laid this stone path 5 years ago ! Time sure is flying by ! Thanks Keithsmum. This bed isn't as full this year due to the poor economy. I had to cut back a little this year. Luckily the shrubs on the left side have grown considerablly this year and help may it look full. Guess I should post a pic of this side of the garden sometime to show how the shrubs have grown. That would be great, I'd love to see it. WOW! .... THAT is what I want some day.. Absolutely STUNNING area! My compliments to the "chef"! What an absolute knock-out, drop-dead gorgeous area! You're too sweet N2....thanks, so glad you like it ! I live in the foothills of North Carolina. We live in Zone 7a with a aavg low temp. of 10 degrees F. What zone do you live in, down there in Texas ? are perennials down here and often bounce back the next growing season. I don't doubt that....lol ! I still cannot get over the beauty of that area... What an absolute masterpiece of gardening design! So many textures, colors, and variety! That's what I'm hoping for next year.. The organic program in the back yard this year has had only a 2% failure rate in the plants that I have put in the ground and I suspect that the best "plan of attack" for any garden area is to select native plants and others that are better suited to the local soil conditions. I have noticed that once the local soil has been amended with with the proper "rock powders", I.E., Green Sand, Lava Sand, Expanded Shale, and then treated with "Dry Molasses" and "corn gluten-meal" for a "pre emergent" early in the growing season beginning, those do much better. Can't wait to see what you come up with next year N2. You certainly have the most important secret to gardening down pat already and that's, great gardening begins with the soil. The rest should be a breeze. Yes, the soil is the key. Be it container plants or whatever anyone wants to grow. The basic soil is the key to growing successful plants! If your garden area lacks that magic "biological balance" in the soil that Mother Nature needs, plants will fail. It's a fact of life.. The same technique works for potted plants but is much harder to maintain. Potted plants need to be watched FAR more closely than "plants in the ground". Water control is the key to keeping those little guys alive! The best start for any pot or garden area is a through organic preparation! Great garden! Beautiful path. Did you make it yourself? 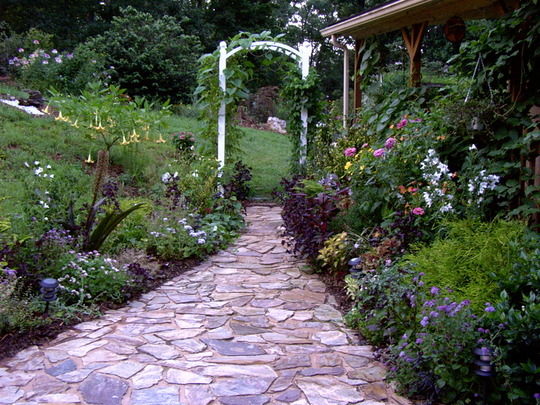 Your Flagstone path is now a page on my web site, so others can benefit from your expertise should they decide to make their own! Thanks so much for sharing it with us! Oh Wow the path is amazing - the rest is too very pretty . I need to download a photo of what it looks like now. Beautiful little path looks like it leads to quite the floral adventure.